The Age of the Gods slot series from Playtech is a compilation of video slots launched in 2017 to replace the regretfully retired Marvel games. The series is quickly gaining kudos from former Marvel fans and includes the titles King of Olympus, Furious 4, Goddess of Wisdom and the epic Prince of Olympus video slot. 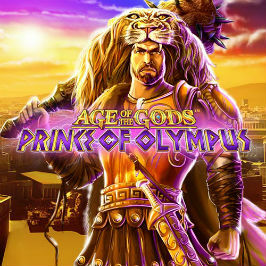 Age of the Gods: Prince of Olympus is centred around the mighty demigod Hercules, famed for his power and rage. This game definitely has strong credentials to gain legendary status, with free spins, 300% multipliers and Herculean strength bonuses over its five reels and 25 paylines! Play Age of the Gods: Prince of Olympus for Real Money! 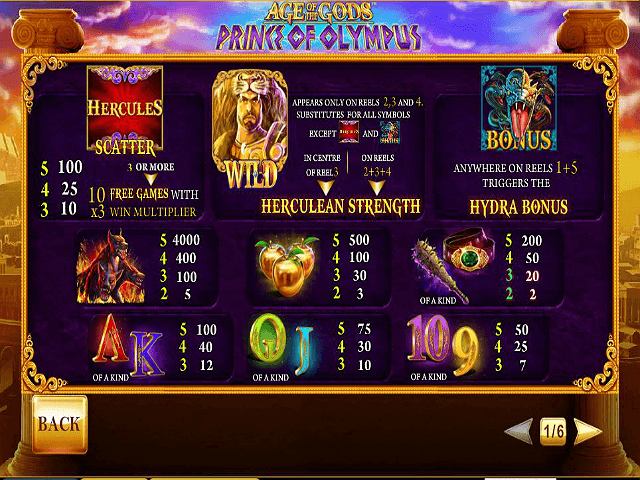 Age of the Gods: Prince of Olympus slot has been launched by Playtech software on the back of the demise of the developer's Marvel franchise games. 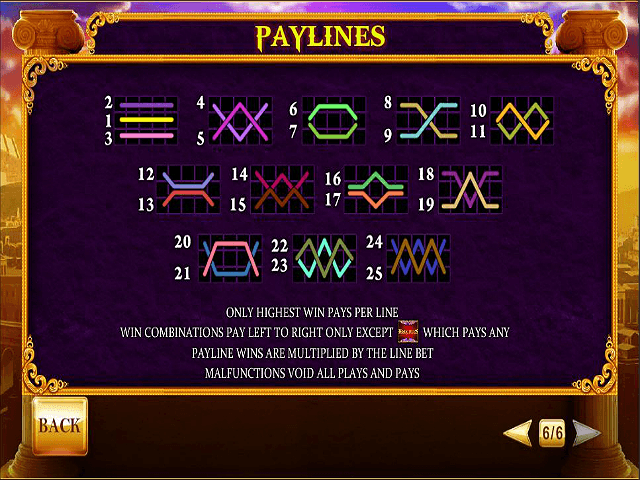 The five-reel, 25 payline slotscape is extremely high end, with opulent graphics taking players into the world of the divine hero Hercules – son of Zeus and infamous for mighty strength and endless adventuring. The adventures are indeed relentless, as a classic array of mythological symbols fill the reels – including golden apples, Herculean clubs, ancient numbers and letters, jackpot Orthrus dog head symbols and Zeus in wild, scatter and bonus forms! Hydra Bonus Game = The Hydra bonus feature is triggered when the symbol is matched on reels one and five on the same spin. The player must use the power of Hercules to shoot down the Hydra with their arrow skills; slay them all and win a multiplier up to 5x. As an extra bonus, the Herculean Rage feature can be triggered to lay the smack down and take out the Hydra instantaneously. Gamers familiar with the Incredible Hulk Rage will have enjoyed this element before. Free Spin Bonus = Landing the Hercules scatter symbol on the reels rewards players with the gift of the gods: ten free spins with 3x multiplier. Finding three more scatter icons boosts the reward to 20 free spins. Within the free spin bonus, gamers can also randomly benefit from the Herculean Strength feature. Herculean Strength Feature = This is the reward for epic casino slot adventurers – gained when Hercules' wild symbol stops in the middle of reel three. Hercules will expand with all his might and fury to give two free spins while the wild is held in position. Even better, if the wild icon lands on the three middle reels, it expands on all three, while giving the player a potentially lucrative re-spin. 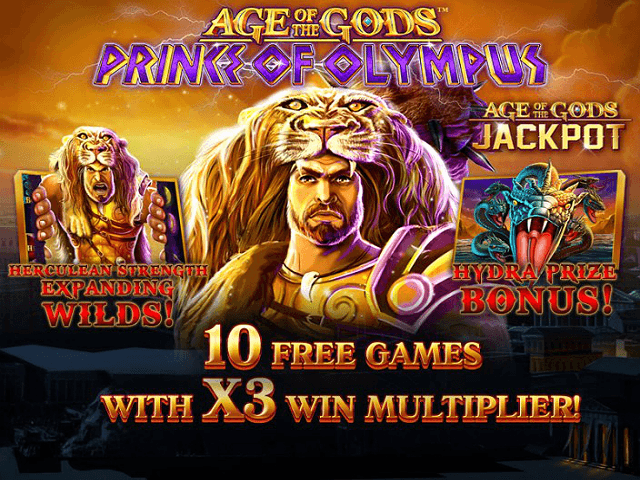 Age of the Gods: Prince of Olympus links in with Playtech's 'Age of the Gods' progressive jackpot network, which can pay out millions when randomly won on any spin. The game pools its progressive jackpot with bets from the other titles in the 'Age of the Gods' series including the original installment, Age of the Gods, as well as the other games. Gamers enter a coin-filled screen and must click the coins to determine which jackpot pool they scoop. Higher bets boost the probability of winning. Age of the Gods: Prince of Olympus is a high-action slot with video gaming graphics, excellent bonus features and neat sub-plots. Lovers of Marvel will appreciate the power! Share this Age of the Gods: Prince of Olympus Review today! 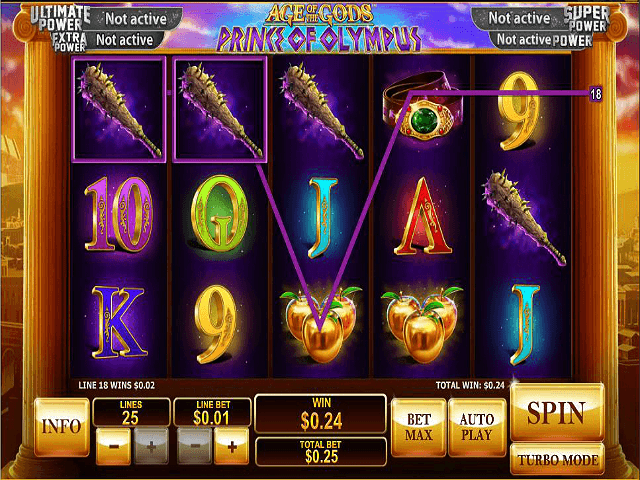 If you like Age of the Gods: Prince of Olympus, you'll love these slot titles too!